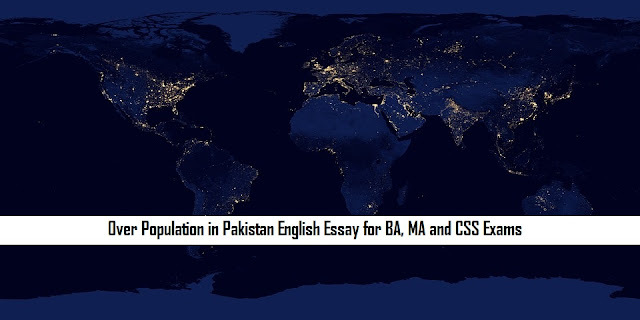 Here's a great note for educational purposes and you can copy, edit or take notes on this Over Population in Pakistan English Essay for BA, MA and CSS Exams and easily prepare for your English exams. rate of 2.6% annually during census of 1998. Population expansion is a problem only when the rate of population expansion is exceeding the rate of expansion in resources. The rate of progress decreases with population expansion and the national resources go waste. Another view is that the earning members in a family are a few. The rest of the members depend upon them. This brings down our family income. In most of the Middle and Eastern countries the men work and women remain in houses. Although it brings peace in family and economically the per capital income remains poor in most of the cases. Those people who are facing population explosion feel least dissatisfied. They say, we are satisfied and have no problem. They believe on nature and then on their labor. On the other hand the economists, sociologist and other experts feel this expansion is a great menace to human life. They say that most of the human resources are consumed by the exceeding number of family members which brings down the standard of living. It means 2.7% population of Pakistan is increasing in one year. It is the increase in population with the number of birth by living in a population of 1000 people in one year. It is the number of death in one year of a population of 1000 people. It is the movement of people from one place. to another for any reason. If the birth rate is higher than the death rate, the natural increase will be the same difference of numbers in that population. if the people from rural areas migrate to urban areas, the population of urban area increases and the population in rural areas decrease with the same ratio. Therefore, expansion of population depends upon these three factors as explained above. employment with business and trade. This population expansion is not a problem if we have sufficient economic resources within the area. The number of houses, food, facilities of transportation and communication, the number of doctors and teachers, schools and hospitals, if are in sufficient number and according to the requirement of the people. Lack of resources if found in the area, the people feel population as their problem. If they have sufficient quantity and quality of resources, they have no idea of population problem. Some people solve this problem by limiting the number of children in family. They control birth of children to the limited number according to the life standard of the family. This program is executed through Population Welfare Department the country in which experts of population are employed with male and female medical staff as advisors to the husband and wife. following are the causes of population expansion. People like to have more and more number of children as a matter of prestige. Having more number of children is cultural value to the prestige of husband and the wife. During Aryan and Dravidian cultures, this tradition was given the highest prestige. That is why, man used to marry another woman if he could not get male issue from his wife. If there is any defect in health of wife he used to marry another one. At the death of wife he married another woman without any fear of expenditure. Having more than thee wife was also a matter of prestige with more and more number of children specially males considered as a prestige of culture of the people of Indus valley civilization. If male child is not borne to a wife the husband married mostly with another woman for this purpose. It is the main reason of getting plural wives as a custom of our culture. This tradition is still finding its roots in our culture. The husband, who failed to get issue from his wives married other wives to get birth of children. Our Federal Shariat court issued judgment that having more than one wife is not forbidden in Islam. It is allowed according to Shariah of Islam. This judgment was enforced with effect from 31st day of March 2000. This judgment made amendments in section 7 of the Muslims family laws ordinance 1961. Allowing marry with more than one woman at a time is according to the Shariah of Islam. This judgment was published in PLD 2000 Federal Shariat Court 1 with Mian Mahboob Ahmed, Chief Justice of the Shariat Court. Remarriage for widow women has been allowed which was also allowed with the Aryans in the Subcontinent culture. This also increased the number of children with the father Child birth became the most important value and ideology for a Woman and a man. The climatic condition of Pakistan is rigorous and stiff. The climate of hot season rises u to the high grade of temperature resulting in intense heat in the area with little rains and cold air. This creates intense temperament among the husband and wife. With the heat of the climate, they are able to produce more children with little gap between them. This was also affected by lack of recreations within the house. Small and congested houses are also the main cause in which husband and wife see face to face frequently resulting into close proximity with childbirth. A desire for male issue is. the main aim of marriage for the husband. He wants a son, second son, third, fourth and so on, all Sons to be his sons born within the family. He is proud of having large number of sons within the community. For this purpose, he marries more than one if this desire has not been fulfilled. Having maximum number of children, sons and daughter is the main aim of marriage not only for husband and wife but for their parents also. If this aim is not. fulfilled, the parents of the son advised him to marry another woman for this aim. That is why the number or children goes on increasing, specially in rural areas with a population expansion. The standard of health, and sanitation increased with the information, education and media being available at all places of rural and urban areas The people are aware of problems of ill health caused by dirty houses and dirty clothes. They make their houses clean and use clean cloths with pure food for healthy children and healthy life. This has increased life expectancy and dropped down the ratio of death rate. Medical facilities and maternity centers are available both in rural and urban areas in large number. Here, the women are provided facilities of childbirth and basic maternal health care. The death of child and mother at maternity occasions has been reduced to minimum in our society. The standard of food and nutrition has been increased due to better standard of food stuff. Eggs, meat, rice, milk, fish, poultry and vegetable are the main items of food, along with oil and ghee used in cooking. Fruit of all types in different seasons are eaten by the people, both in rural and urban areas according to their economic resources. The diseases have been controlled like Tuberculosis (TB), malaria, typhoid, fever, jaundice, flue and cold. Cancer being a disease has been partially controlled within the clinics of Pakistan. The standard of health has been increased with reducing the number of death. The main cause of good health in Pakistan and raising the average age is due to heavy use of proteins in food. Early marriages are also a main reason of having more children. Due to this, reproduction span of female increases hence women conceive more children. Due to over population, there is a shortage of houses in urban areas. This problem is more sever in big cities like Karachi, Lahore, Rawalpindi and islamabad. People are force to live in katchi abadis and filthy areas. Due to population pressure, prices and rent of the houses are very high. A common man is not able to purchase or hire a better house. Due to over population, cities are facing problems of uncleanliness. There is no clean street and in cities. Moreover, management of garbage is becoming another issue for the administration of the cities. Due to over population, illiteracy rate is very high because government required billions of rupees to address bulk of over population. Hence, schools, colleges are working with very poor facilities. Even there are many areas, where schools are not available for the children of the area. They have to travel many kilometers to get education. Due to population pressure, country is facing shortage of food. Due to this food shortage, quality of food has been decreased. People bound to buy impure and unhygienic food for their children. Hygienic and pure food is quite expensive which is not affordable for every individual. Due to large size of population, people are crying for basic facilities like, health, clean drinking water, pakka roads, schools, drainage of sewage water, better transport and clean air to breathe. This can also be possible if size of the population is reduces up to the required level. Unemployment is also one of the outcomes of over population. People are more and jobs are few, hence unemployment is at rise. Per capita income of Pakistan is very low because earning hands are few and eating mouth are, more in every house. Salaries and wages are very low due to availability cheap of human resource. This is all due to over population. Due to population pressure, institutions like health, education, transport, water and sanitation etc are not able to deliver quality services. Therefore, people have to rely on poor quality of services of these institutions. Due to over population, people start migrating from rural to urban areas. This trend increases the burden on the cities. Big cities like Karachi, Lahore, Rawalpindi, Faisalabd and Multan are the victims of it. Over population also causes crime and breed social evils in the society. Due to over population, anonymity in the cities is increasing. Even people are unaware about the identity of their next door neighbor. Due to over population1 traffic problems in the big cities have been increased. People used to trap in the traffic for hours. Due to over population environmental pollution is increasing. This is more prominent in big cities of the country. Deforestation is also increasing in order to meet the shortage of houses. Pollutants of the industries are also damaging the ecosystem of the universe. Due to above mentioned impacts, over all quality of life has been decreased. People are not enjoying better quality of life even in the presence of facilities. Population growth rate is very high in comparison with economic growth of the country. This should be reduced through natural or artificial ways by the government on priority basis. Because this is the main cause of over population and if it is addressed, the whole efforts of reducing population would become successful. Technical education should be given to the people and no one should left out of it. In this way, people will earn more and able to afford even a large family. This should also be started in the rural areas of Pakistan. Those who are doing nothing and unemployed should be utilized through giving jobs and other work which they can do. Thorough this, people will earn more, consequently, economy of the country will grow which in turn will positively reduce the growth of the population. To reduce population growth, family planning program should be made more effective. Objectives of the program should be made more clear to the people. information regarding this program should reach up to the every citizen of Pakistan. For this, a massive campaign may be initiated. Religious people should also be included in it SO that apprehension of the people regarding religion may be addressed. Generally, people are unaware about the problems and consequences of over population. They do not consider it as a problem of the country. They should be made conscious and aware about negative effect of Over population. For this, an effective campaign thorough media may be started. Pakistan is one of the largest populous countries of the world. Some economists believe that population is a big resource if properly channelized and utilized. So keeping in view, government should try to utilize this great human resource like china. Women should be encouraged to get job in all walks of life. Through this, their potential and skills will be enhanced. Additionally, they will earn some money in order to meet expenses of the, family. Secondly, after getting job, their chances to conceive more babies will also be reduced. Majority of the population is illiterate and do not take this problem seriously. They even don’t have idea of negative impacts of this high population growth. This kind of situation is common in rural areas. Hence people should be given education up to higher level. Adult literacy programs may also be started for the purpose. If you need more essay examples and want to read more of them then stay connected with us and look at our website to find more essays easily.